Last night we were under a frost advisory, meaning frost was unlikely but possible. Tonight the advisory continues. The trees have begun to turn. In Manitoba, the lower ground cover herbs and bushes turn first into gorgeous flaming reds, deep purples and brilliant orange and yellows. They are then followed by the trees which turn yellow and then brown with the exception of a few transplanted nonlocal varieties that give a brief dash of colour other than yellow. The lake where we went swimming this summer has already gotten unbearably cold and the swimming season is definitely over. The four types of swallows we have had around all summer have vanished. yesterday I saw them flocking tightly and sitting on the power lines. Today they are gone. Their nests are empty with their babies all fledged and gone with them. The hummingbirds and the orioles will vanish soon too. I think they take their signal from the frost. One frost and they are gone. In the place of the swallows we have innumerable big heavy northern Canada geese who are pausing in our area to feast on our wheat before they go further south. The farmers are racing the geese to get the harvest in. I expect to shortly see the numbers of sand hills cranes go from a dozen or so that next nearby to over a hundred as they gather to get ready for their migration. By the time they get to the US border they will be numbering in flocks in the tens of thousands. There is a feeling of fatigue in the plants. They struggled and fought to grow as fast as they could during our long long summer days and now they face frost and with the equinox in only a few weeks, more dark than sun. They have dropped their seeds and the edges of the plants look battered and worn out. It’s time to get ready to sleep through the cold. Time to pull down whatever parts can be saved into the roots and hope for the best when temperatures hit -40C. My notes for next year include reducing the number of small tomato and increasing the number of larger varieties. I planted three each of small yellow, red, and orange and three Tiny Tim. I also planted three beefsteak, three medium red and three medium yellow varieties. I have too many small ones and not enough large ones. Next year I will do 2 each of smaller strains and four of medium yellow and red and at least 6 beefsteak. And some better sturdier tomato cages are also on the “to buy” list. The corn did much better this year and we have been enjoying a corn on the cob for dinner every night for a week now and I think we will have another week yet. I attribute this to being more careful about watering during the early stages and so that will my note for next year. Again, water your garden if the rains don’t fall. I had one giant Russian sunflower plant. I do love those. They dwarf the corn which this year was taller than I am. I leave the seeds for birds. My zucchini have done stunningly well this year. We have had home grown zucchini in a steady supply even for a couple that likes to eat one small one each day for breakfast. I have already collected and dried and prepared seeds for next year. Note to self: repeat procedure for next summer precisely as you did this summer. The perennial herbs I started last year, oregano and sage, did very well. This year I started a perennial (for our area) rosemary, parsley and cilantro. They are doing well for the first year. Perennials I started last year (or the year before as in the case of the asparagus and horse radish) have done very well. My herb garden had three herbs survive the winter and flourish. Hopefully next year that will six. This has been a year for beets. I have so many beets I am not sure what to do with them all and that includes after giving them away to anyone who wants them. I have made six jars of pickled beets. I won’t make more until I am sure we actually eat them. I froze a bunch of beet greens as one prepares spinach. We haven’t tried eating any yet because we can have fresh beet greens anytime we want from the garden. I am considering digging up some horse radish and making beet horse radish preserve. Yesterday we used or new juicer to make lovely juice from the fresh apples on our trees. Garlic, onions and leeks which I started from seeds which I collected last year have been very successful. Garlic and onions grow to set size in one season and then you can dry them and replant them the following year for eating and harvesting more seeds. I have a year’s supply of both plus enough for planting as sets from this year’s crop. Furthermore, I have enough seed put away for next year. I planted leeks and while our season is too short for full sized leeks they did grow large enough to be used in place of green onions for variety in salads. I will plant leeks again. 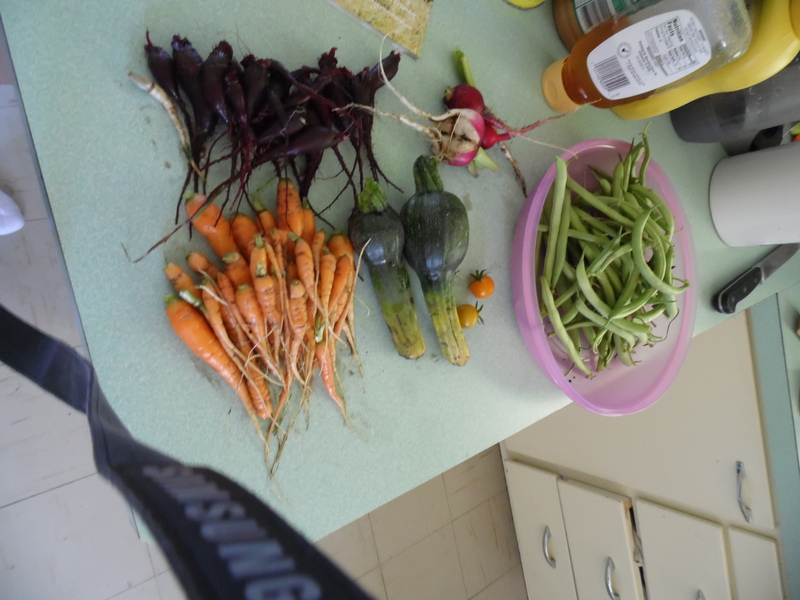 I also had greater success with carrots and radishes this year. I actually got radishes to eat and the carrots have been great. I planted a mixture of coloured carrots and we have erects in purple, white and yellow in addition to traditional orange, all of them delicious. I attribute this to two innovations. I used that seed tape so they were spaced properly and I thinned whenever they got too thick. Note to self, thinning is good for carrots and radishes. It has also been a good year for lettuce. I still have garden lettuce that has not gone to seed. I planted the lettuce in a shady part of the garden and it has thrived instead of going bitter and seeding. The only downer is that we didn’t get lettuce until much later in the year than is normal. What we got was good but I think two plantings next year, one much earlier, will mean better results. I will give only half marks for my cucumbers. They have not produced as much as last year but I have put aside enough pickles for the year given last year was so prodigious and we still have a few jars left. The main reason they did so poorly is because I mixed up my planting rows and put the cucumber plants in the carrot row and too close to the corn. The cucumber plants have been crowded and shaded. Note to self, better signage and don’t trust your memory. Eggplants….well I got one small one. I put the eggplants in the corners of the herb gardens. I also didn’t start them soon enough indoors. Eggplants are slow growers. They need to be started indoors at least three weeks before tomatoes and zucchini. If I fail again I will give up on eggplants for northern gardening. My fruit efforts paid off rather well. My raspberries have gown and spread from the one plant to many in two summers and we had three weeks of a few raspberries a day and a week where we had a handful a day. Plus we have had even more new growth. Next year I might even be able to make my favorite jam. My little Saskatoon bushes have more than doubled their size. It will be a few more years before we get berries but I can dream. My strawberries also did much better than last year. I had a battle with slugs and the birds got most of them so I need to consider some way to manage that. Suggestions? I am looking at nets and traps I guess. Even so we had a few strawberries almost every day. The two cycle ones did very well in the late August bearing round but unfortunately our new puppy loves strawberries so she got most of those. Her nose is far better than my eyes and she finds every last one. My peppers? Better than last year but not by much. I got two green peppers and some hot peppers, enough to two jars of pickles and two of salsa. They need to be started earlier indoors as well. Earlier for peppers and eggplant, mid spring for tomatoes and only six weeks before potting in the final big pots for zucchini. This year we planted three times the amount of potatoes and they did very well. We have been really enjoying the potatoes but we only planted one variety, Yukon Gold. Next year I want to expand the potato and corn in the back garden area and plant more varieties of potatoes. I really missed having fresh from the ground red potatoes I love so much. We could triple our crop and still eat them all. We started three more plants in our yard. We planted many more small evergreens. We got free plants to celebrate Canada Day. (Well not really free since our taxes paid for them.) At the end of the festivities leftover baby trees destined for the garbage were rescued by Hubby Dearest and we found homes for all of them. Some went around our yard to fill in gaps in our windbreak. Some we gave to local folks who were happy to get them. The remaining 120, we planted at our bog/farmland. The trees are a native white spruce that used to be abundant around here but were largely harvested by settlers. Even if a few take on our land then generations of neglect and local species extirpation will be undone. We also added a hardy small apricot tree. We started with four babies but only one made it. (We got a credit for next year with the nursery.) We also started some shade loving perennial ground cover our neighbour kindly gave us and it has settled in nicely and should cover the ugly spaces under the deck very well as it spreads. I found the planting boxes I made last year are really nice to work with. It is far easier to decide to weed a box than to look at the garden and see masses of weeds and not know where to begin. I have enough material to make four more boxes. I want one for my peppers so they can get more TLC. I want to get the eggplants into their own box and have one box for my leeks, onions and garlic. That will free up my herb garden for the parsley and cilantro and rosemary. I want one box for my “special projects”. I ordered and got a package of seeds for four colour varieties of raspberry. Those need to go over winter into a safe spot where I can find any seeds that successfully grow in the spring. I want to always have one box for fun stuff like that. Last note to self: I need to be certain to space the row in my garden much wider than I did this summer. I had planned to be able to go up and down the rows with my little electric rototiller but I didn’t space the rows enough. The result was if I tried to use the rototiller, I buried the rows of little plants and so I really neglected the weeding. I also lost the dill, spinach, kale, turnip and peas I planted by rototilling them. That was my big disappointment this year. Live and learn. And that is how it goes if you are a gardener. Some successes, some losses, and you learn more each season. I am sad the season is coming to an end. I wish I could be thinking about a fall garden like my friends in the south. Up here at the 51st parallel we are lucky to have a summer long enough to get much of anything. It is time to think about stews and soups and electric blankets on the bed, and frost. The snow doesn’t usually stay on the ground until November but we should see the odd bit of flakey white stuff that melts away fast by the time this month ends. Winter is coming. It is not just a theme for a TV series. At the 51st parallel, winter is an ever present reality. This entry was posted in gardening, Rural Manitoba, small town life and tagged fall, gardening on September 6, 2017 by tumbleweedstumbling. My husband and I are big fans of zucchini. Our typical breakfast includes fried zucchini, lots of it, with mushrooms, onions and eggs. Naturally, zucchini plays a big role in my garden. I have tried for many years to get zucchini to grow consistently and well. It is not as easy as I thought it would be but this is the second year now we have been enjoying early and great abundant zucchini. So I think I have the knack of it now. As my followers will recall, we live in Manitoba near the 51st parallel and so we have to adjust our gardening for late and early seasons frosts and occasionally even snow in May. Zucchini are delicate when it comes to frost, and slugs and cutworms love to eat them. After trying for years to get really good zucchini, I finally gave up on growing them in the garden and I switched to container gardening. This way, on nice spring days we can put the plants outside but if we have one of our late May frosts (or even snows) they can be carried inside to warm safety until the cold passes. Since they are going into containers anyway, it makes sense to start them indoors under artificial lights. I started mine April 15th this year from seed I saved from the previous year’s harvest. I had both yellow and green (actually called “midnight” variety) that grew very well for me. Since we like to eat our zucchini young, that meant leaving some to grow large enough to produce mature seeds. That happened more towards the end of the season when we had so much I was actually getting sick of it. The zucchini grow quickly. In this image they are only about three and a half weeks old. The tiny tomato plants beside them were started at the same time. Zucchini like rich soil, and they require a lot of water but they also like good drainage. This is why some successful gardeners put them on hills in the garden. I started mine out in high quality potting soil. Zucchini are subject to blossom rot (like tomatoes) so I added extra calcium powder and ground egg shells to the soil. Deeper pots work better in the early stages as the zucchini like to set deep roots fast. Zucchini also like to grow with companions so I start with about six seeds per pot and then reduce it down to two plants per pot once the first leaves are open. Zucchini also need abundant sunshine and so as soon as possible I put them outside in my little greenhouse. At about six weeks, I repotted them into some large pots I scrounged from the local dump that were originally used for transporting trees, again using the best quality potting soil with water conserving beads and fertilizer. (Pot size is 12 inches (30cm) around and 10 inches (24cm) deep.) I topped up the calcium in the bigger pots as well. I started with six pots going. Four are yellow and two are green. I gave one to my neighbour who has also had trouble getting good zucchini in the past. Another advantage to getting the plants outside well before it is warm enough for the garden is to let pollinators get at the blossoms. My plants had blossoms by when they went into the big pots at 6-7 weeks and they were soon full of busy bees, especially bumble bees. The plants grew and overflowed the edges of their pots. By June I didn’t have to worry about carrying them inside overnight. I moved them into their own sunny location in the back part of the lawn. The nearby trees provide shelter from the occasionally fierce prairie wind and they are near the rain barrel. Even in these pots they need watering almost every day. They do much better with soft rain water than our extremely hard iron laden tap water. It is important to pick the zucchini young in order to keep the plant producing more. Last year I noted that the zucchini ran roots out of the pot into the ground and seemed to halt growing for a few days when I moved them. So once they are in their place on the lawn I now try to mow around the pots rather than move the pots to mow. My final tip is that as soon as the first two plants are producing zucchini, put in more seeds near the edges. Allow two of these secondary plantings to reach maturity for a total of four plants per pot. The second pair of plants will take over peak production just as the first set are getting too old. And we are now enjoying the rewards of my not-too-hard work. It is more about planning than work. I picked my first zucchini last week which is nine weeks after I planted the seeds. Yesterday I harvested four good sized zucchini. Two are yellow and two are green. One of the green ones I made into a layered zucchini vegetable lasagna. (Cooking tip; zucchini have a lot of moisture so I find you need to double the typical cooking time fora lasagna and leave the lid off for the last half of the cooking to make a good texture that is not watery.) The other three are in my fridge and will be consumed soon. This entry was posted in Frugal living, gardening, Rural Manitoba and tagged container gardening, gardening, zucchini on June 16, 2017 by tumbleweedstumbling. Oh winter, when things are cold, the ground is frozen and one can only dream of summer. (I am spending my winter in Florida so I really can’t complain too much!) And I am dreaming! Oh how I am dreaming. Since my garden last summer was such a great success and produced so much lovely food I am full of dreams of this year’s harvest. Things never come out as perfectly as the retouched garden pictures in the seed catalogues. I don’t care. I enjoy dreaming over them anyway. I made many notes for my failures and successes of last year and my plans are in full swing. The Canadian dollar has dropped to .69 on the American with the result being all foods in our grocery stores that are imported have skyrocketed in price. And so my Canadian dollar invested in garden seed has the potential to produce food worth a lot more if it comes from the garden making a pay off even more likely. I purchased a small greenhouse and a plant starting light. If I get even half the plants I normally buy at the nursery that investment will have paid for itself this first year. I have tried starting things from seeds before but they always got spindly and sickly and never amounted to any size worth the fuss. Maybe with lights and a mini greenhouse they will this time. Last year I had some weed issues. We had a fellow come in with a big tractor at the beginning of the year and he did a fine job working the garden up. I could have used a second tilling before planting but I was too impatient. The garden is only as good as the soil so this year I have done two things. First I made a great big note to till twice before planting anything. I also bought myself a small tiller. I will have the man with the great big one come in to do the first till and then I will my small tiller to do a second tilling as I plant and I will have the new tiller to do the rows in between as well. That should make my life easier and the weeds less trouble. Worms got my turnip crop last year so this year I will be putting them in a different location, sprinkling the area with diatomaceous earth after each rainfall and picking a lot earlier. I will also try the trick of planting some marigolds in among the turnips. Hopefully I won’t have maggots this year. I have on my list saskatoons and strawberries. Getting fruit to grow in our climate is problematic but these grow wild in our area and we love eating them. So it should be possible to have two cultivars that give big abundant fruit planted. We won’t get much this year but the future looks bright. I may have to destroy some of the bushes the previous owner planted that do nothing but look pretty before I can find room but I will. I’ll take a tree/plant that gives me something to eat over one that looks pretty anytime. I may make an exception for marigolds if they keep the root maggots away. Last year I got sloppy about labelling rows and ended up with rows I knew were beets, turnips and kale but I couldn’t tell which was which. We ate a lot of really great green salad from when I was thinning the plants but this year rows will be properly marked. Plus I am adding some cooking greens that can be preserved in addition to spinach, collard and mustard. If I succeed I will have a little of the south in the north this summer. Some other notes were to grow cucumbers on tomato cages like my neighbour did with hers to make picking easier, plant smaller amounts but more varieties of herbs and plant more varieties of beans. I have always had bad luck with peas but I think I will try them this year as well. If anyone has a foolproof way to avoid having them turn white and fungus filled peas, I am all ears. My garden seed list is now at almost $250 the largest part of the seed expense being Saskatoon and strawberry plants, seed potatoes, and other larger “stuff”. Last year I kept careful track of my seed and plant costs and the garden more than paid for itself. In fact, I still have one last lonely container of frozen tomato sauce and some beet/horseradish spread. It makes me wince to think of hitting the send button on that order but spring will come, a gardener’s hope springs eternal, and the winter does end. Those cans of tomatoes look like I preserved the sunshine and warmth of summer. I would love to hear if anyone else is planning their summer garden and what they are planning. This entry was posted in Food preservation, Frugal living, gardening, Rural Manitoba and tagged do it yourself, gardening, Rural living on February 4, 2016 by tumbleweedstumbling. What could be simpler than a plain roasted chicken, some boiled corn on the cob and potatoes? What could be more delicious than your very own corn picked from your garden and baby potatoes you dug up just before throwing them in the pot? The corn was small and stunted and so the cobs were half the size of a store bought one but what they lacked in size, they more than made up for in taste. And potatoes, heavenly. I noticed the garden turnips are ready too. I’m not a big turnip fan but Hubby Dearest loves them. We’ll start eating those soon. I am also still drying seeds for next year. We will have a chance to try out the community garden and greenhouse next year with our own seeds. It’s raining outside and the cool nip of fall is in the air. The days are shortening so half the evening is dark now. I had to rake leaves yesterday. We are planning our trip south for the winter. 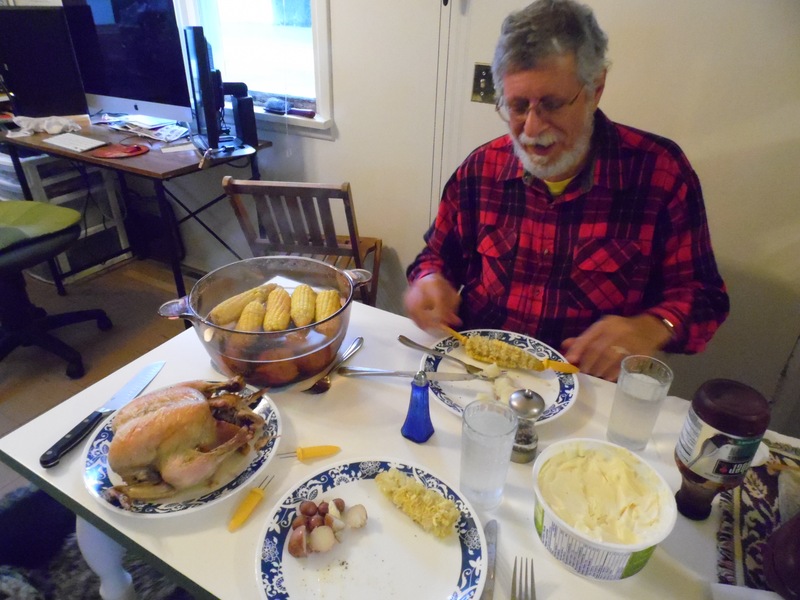 But today, for our dinner, we enjoyed the simply sweet pleasure of plain chicken, and our own corn and potatoes. Life is sweet. This entry was posted in Frugal living, gardening and tagged Alonsa, Frugal Living, gardening, Manitoba, Rural living on September 6, 2015 by tumbleweedstumbling. As I expected we found ourselves swimming in lovely fresh garden tomatoes. No matter how many we ate, they ripened faster than we could eat. I decided to get production back to controllable levels by canning three large jars of them for the future. Many years ago when I canned tomatoes, the pressure cooker made me nervous so I used the old fashioned boiling water bath method. Today I am very comfortable with the pressure cooker so I did the cold pack, ten minute method except I went for 20 minutes instead of ten. I find the pressure cooker method much easier. It doesn’t heat up the whole kitchen the way the boiling water bath does. I also added my own onions, garlic and some store bought celery to the jar before canning. The tomatoes are a mix of yellow and red and the yellow ones are considered low acid so I also added a tablespoon of lemon juice just to make sure the acid level is high enough to avoid problems even though, with pressure canning, botulism shouldn’t be an issue. These tomatoes will make great sauce later with the year when the garden is finished. I will put them on the new shelves I have been building in my storage closet/tornado shelter. There is a lot of personal satisfaction to putting your own home grown food by for later use. It’s only three jars because the I didn’t plan a garden for getting a whole years worth of veggies. I did that for three years in the past when I lived on a farm and we did what was basically subsistance farming. Next year I will consider more tomato plants and maybe more canning. In the meantime the jars are cooling, the colour is lovely, and three jars of stewed tomatoes worth about $15 will end up in my basement after about 30 minutes of work. 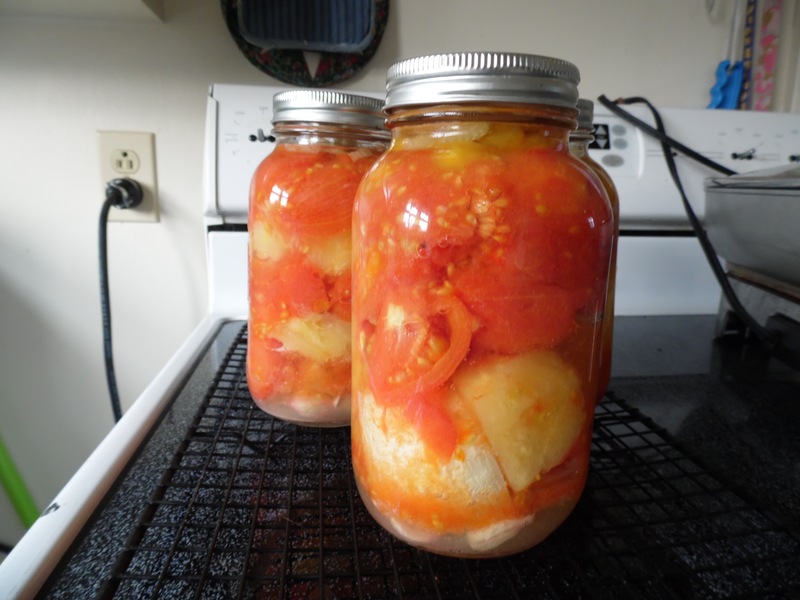 This entry was posted in Canning, Food preservation, Frugal living, gardening and tagged Alonsa, Frugal Living, gardening, Rural living on August 29, 2015 by tumbleweedstumbling. The garden is now at the point where I am thinking rather wistfully of frost. This is today’s haul and is typical for a day. The robin has fledged her second brood and so she is no longer on slug duty and they are thick in the garden. I am finding I have to pick the tomatoes as soon as they begin to turn or the slugs eat holes in them. In one of our big winds several of my tomato cages got knocked over so I am also picking tomatoes off the ground even if they are still green. Yesterday I made spaghetti sauce from scratch. I have been giving away excess but I will very shortly have to begin canning tomatoes. I like to make fancy stewed and herbed tomatoes when I can since those are expensive to buy and take very little extra work if you are canning anyway. At the rate they turning by week’s end I will doing my first big batch. The cucumbers have been a disappointment though not really due to anything they have done. It’s just been too darn wet. I should be at the top of the production of pickles but I am barely getting a small jar a day for pickles. I am also beginning to harvest the carrots, not just thin them, picking as much as we can eat in a meal every other night. Making pickles means garlic and as you can see by the muddy white ball, my garlic has been the best I have ever had. I have begun using it up one plant at a time and I am about 1/8 of the way through what I planted. The beets and turnips are growing fat and sassy. I am leaving them for later to let them get to a decent size. I actually have corn ripening. The cobs are small but we might actually get a taste. Some of my potato plants looked like they were giving up and dying, withering away without blooming, so we dug up the three plants. I planted five different types of potatoes and it would seem the red ones, my personal favourite, are the ones that are giving up. (I didn’t note which ones I planted where figuring I would remember but I didn’t.) The red ones didn’t die in vain since we got some fresh potatoes in the dig, about 4 per plant. We do have enough for a couple of dinner and what is tastier than new potatoes? Note to self, the other varieties are doing just fine so next year repeat that assortment of varieties since conditions can vary so much. I have found the red ones perform well in drought in the past so I think the wet was what made the red ones unhappy this year. The purple and white plants look especially good, still vigorous and spreading and they have not bloomed yet. They must be good for wet years. And of course there are the zucchinis. One plant is still having blossom rot issues but the other two are putting out at a fine rate. We are still eating our own zucchini for breakfast every day and loving it. There is very little work in the garden now, just picking and cleaning plants out that are done. I have also decided to try collecting seeds. I planted heritage varieties and a community greenhouse has been put up two blocks away. I will try starting plants from my own seed myself next year and starting my own plants indoors. If it doesn’t work, I can always buy seed and plants at the nursery. If my seeds do work, I will save myself about $100. Funny how you wait all winter to get the garden in, fuss over every little green shoot in May and stand looking at the garden imagining the bounty in June when all you are getting is radishes. By the end of August you start kind of half hoping for frost so you can quit. Now to wash off those carrots and potatoes for dinner. 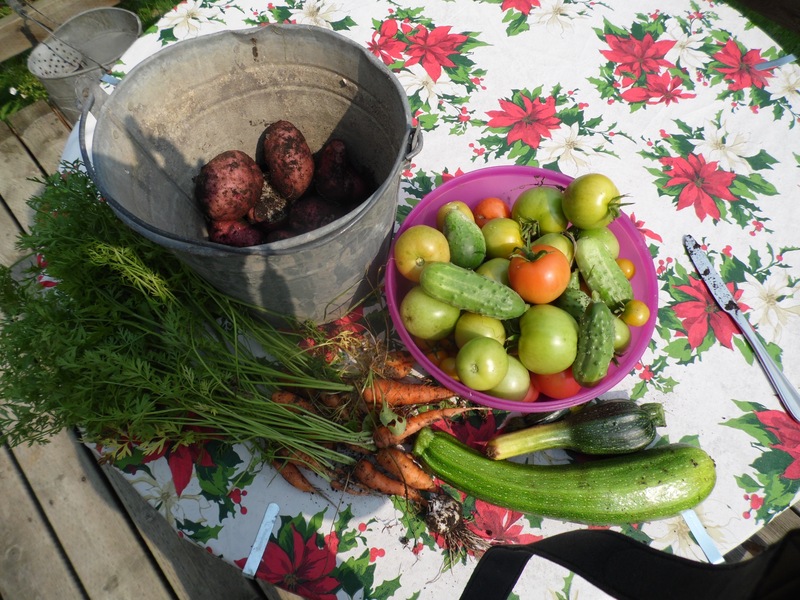 This entry was posted in Canning, Food preservation, Frugal living, gardening and tagged Alonsa, Frugal Living, gardening, Rural living on August 27, 2015 by tumbleweedstumbling. 50th parallel gardening in the prairies. Several thing happened to my garden since my last update. Ten days ago after a week of baking heat, we got nine inches of rain in 48 hours. This was followed by several more days of at least an inch of rain a day. I wish I could complain a lot about this being an unusual year but its not. This is prairie gardening. So in addition to ….long….. summer days, and a short growing season there is insane swings in temperature and water. The long hot days of no rain you can compensate for with a hose and sprinkler. There is nothing you can do about too much rain. Well not quite nothing. I deepened a preexisting trench at the bottom of the slant of the garden to get water to drain a little faster. The trench was put in by the previous owner of this garden patch indicating just how not unusual the situation is. The result of all the wet meant that the spinach promptly up and died except for the fourth planting that went to seed when it was only five centimeters tall and had maybe four teeny tiny leaves. So the spinach is done for the year. With the staggered planting we had several meals of spinach fresh and cooked but we ate it as soon as we got it so none was put by for later. Note to self, more spinach, less staggering. Radishes, well the last of those are in the picture. And you can see what all the rain did. They split. Same note re radishes. The corn has taken on a rather sickly hue of yellow green and it may or may not recover. And one tomato plant that was standing in water for days gave up and died. It also meant I couldn’t get in to weed for nearly a week. The weeds, being prairie weeds and well adapted to this local environment, took off, well like weeds, with the wet. This is why I didn’t plant any peas. Every year I have tried one of these heavy rainstorms has started the powdery mildew and no peas. Some thing didn’t care. The beets and carrots did just fine and today I thinned them again. The results are above and represent a meal of baby carrots and beets. The green beans seemed to absolutely love both the heat and drought and the wet. They are in full swing now and we will be enjoying green beans for a while. I don’t seem to have any yellow beans which is strange because I planted both green and yellow bean seeds. I lost quite a few baby bean plants to frost and now I am wondering if maybe it was all the yellow ones. Note to self, next year separate rows, and green beans seem spring hardier than yellow. The tomatoes are doing very well in spite of one untimely death. They not only have lots of heavy green fruit but they also are still blossoming and we have been enjoying small yellow ones for about a week now. They are beyond delicious and I wish they would hurry up and produce more. The cucumbers took a hit but look better. I have tiny two inch cucumbers. The zucchini responded to the extremes by producing the weird looking ones you see. I think they like wet better than drought though because the weird ones started in the drought and the ones coming up behind these two look normal. The zucchinis are the only thing that has taken over and overshadowed the weeds. We had a huge wind that took out all the sunflowers so they are now lying on their sides and the heads are bent up from the talks at ninety degrees. I think they may still make nice flowers but they look very strange. The lettuce is getting close to bolting but isn’t quite there so we will have lettuce a bit longer. Surprise surprise my experimental spaghetti squash took a great leap up and are now in bloom. They seem to like rain too. And finally the momma robin has been very busy because the rain caused a huge outbreak of white slugs. Fortunately, the robin is now on her second brood of babies and they are hungry little guys who needs lots of slugs to grow into adult robins. So the rain has been good for her. This entry was posted in bird watching, Frugal living, gardening, Rural Manitoba and tagged Frugal Living, Manitoba, Rural living, Severe Weather on July 22, 2015 by tumbleweedstumbling.